Spring is in the air and everything looks so much different when the sun is shining. Take the outside of your house, for example. In the grey of winter, it looked fine but now you might be starting to think that it needs a makeover to brighten it up. Spring is the ideal time to think about painting the outside of your house as excessive rain and damp is being replaced by dry and sunny weather. It is not advisable to do any exterior painting when it is too cold or too wet. However, direct sunlight is not good either, so start on the shady side and move round the house as the sun moves round. To avoid any dampness while painting, stop two hours before sunset. As with painting the inside of your house, you will also need to cover everything outside that could be damaged by paint. Cover the nearby ground, any nearby bushes and anything else that needs protecting. Remember surfaces need to be prepared for painting too, and one of the most important things of exterior painting is the preparation. If any of the wooden surfaces are peeling they must be sanded down for a good finish, and it goes without saying that any rotting wood needs to be treated first before starting to paint. Paint comes not only in a multitude of colours but the quality varies too. Always buy the best quality paint you can afford. It will save you money in the long term, because cheap paint will not last as long and you will therefore need to repaint much sooner. Whichever paint you choose, always read the label before you start painting when it is clean and paint-free and can be easily read. As well as choosing the colour you will also need to choose which kind of paint to use. Whatever kind of surface you are going to paint, you will need a primer. A primer is the important first coat for any painting project. Its purpose is to help the top coat adhere to the surface you are painting. The final coat will be either matt or gloss or any subtleties of either finish. Gloss is oil-based and is more hardwearing. When calculating how much to buy, it is always better to have too much than too little and then have to buy more later. Whatever paint you are using, be sure to seal the can at the end of the day. As with any paint project, it is always best to start at the top and work down and the outside is no exception to this rule. Always keep to the necessary safety measures when using a ladder. Although it might be tempting to lean out to one side instead of going down the ladder and moving it, it is far better to be safe than sorry. Regular painting of the house exterior is part of good maintenance to help preserve it. 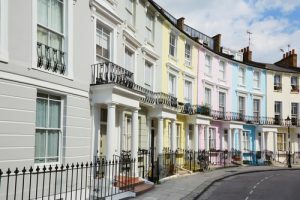 Not only is keeping up the appearance of your house a good investment should you wish to sell later, it also helps to maintain standards in the neighbourhood, which will ultimately benefit you and your house.